We accessed the Burrowa-Pine Mountain National Park by a road less travelled. Taking the first left-hand turn from the Murray Valley Highway onto Jeffcott-Jewells Road we made our way to the Park boundary and then followed the Black Mountain Track just past the Bush Rat Track and just short of the Ross Lookout. The track is a comfortable two wheel drive track and I selected a point where I could easily turn our 4 x 4. I used my tripod and nine metre squid pole and home-made linked dipole. I was hoping for a successful activation and my hopes were not dashed. I began my day by calling VK2TWR/P2, Rod at 03:56, on SOTA summit VK2 SM 072 and then up five, VK3PF/P3, Peter on VK3 VE 072; VK2MT, Rob, on VK2 CT 001; VK3MTB, Tim; VK1MA, Matt; VK3VTH/P2, Tony in Ben Boyd National Park, VKFF026; VK3AMB, Bernard; VK3UBY, Colin; VK3XD, John; VK5PAS, Paul; VK2IB/P3, Bernard on SOTA summit, VK3 VE 082; VK3FIAN, Ian; VK3AFW, Ron; VK3ETC, Ethan; VK5KC, David; VK5CZ/M5, Ian; VK5FMID, Brian; VK2FLEX, Tim; VK3MNZ, Don; VK3XL, Mike; VK2IAX/P2, Richard; VK5LY, Larry; VK5NIG/P5, QRP, Nigel; VK2TWR/P2, Rod on VK2 SM 065; VK5GY/P5, Gordon at Bullock Hill CP and VK2IB/P3, at 05:43, Bernard on VK3 VE 061, making 26 contacts in all. The Burrowa-Pine National Park was accessed fairly easily from the Murray Valley Highway, which traverses magnificent sub-alpine scenery. We were travelling from Shepparton to Corryong and the Park is just out of Corryong. 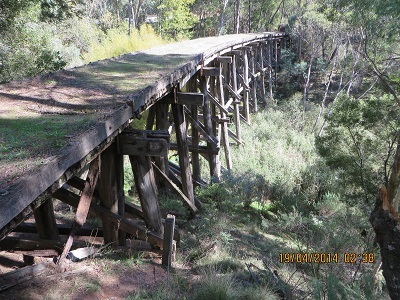 We purchased our lunch in Wodonga and stopped to lunch at the Historic Trestle Bridge. 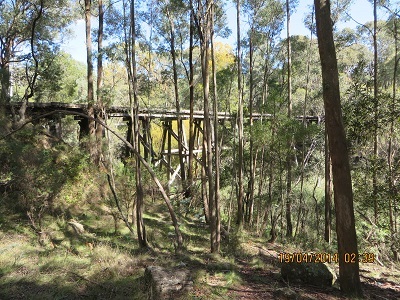 I could not resist the temptation to take a photo of this trestle bridge on the Cudgewa Line. The line was closed on the 22nd January 1995. I have travelled to Cudgewa on a steam-hauled special train many years ago and it was an interesting experience to walk some of the road bed and experience the grades. The rail track bed is now called the High Country Rail Trail and we noticed many people using it: riding bikes, walking and walking dogs.